Nearly three months ago, I purchased a shiny new pair of Shimano riding shoes and pedals. I had previously been riding around on Shimano MOV76 MTB shoes and SPD pedals. These have been awesome and I’m still using them for commuting. As beginner’s kit, they greatly assist the learning process of clicking in and out at traffic lights, whilst providing reasonable connection to the bike. SPD pedals are heavy-ish but nearly indestructible. Within 6 months of using them, I had converted every bike I own to SPDs. However, I felt ,that in the quest to go a bit faster and a bit longer I, needed to try some new kit. I’m still procrastinating over rims but I felt an upgrade to new pedals and shoes would be a sound investment. So I bought a black and blue pair of Shimano R107s and a set of Shimano 105 SPD-SLs. I’ll start with the Shoes. The shoes are fairly light weight, quite stiff and IMHO look pretty good. I got them for what I consider to be a bargain on a internet bike shop at the princely price of $120. I’ve seen them in Melbourne based bike shoes for $60-$80 more. I ordered a size 42 which was the same size as the MOV77 and noticed that the fit is smaller and narrower. In hindsight I would have purchased size 43 to allow for winter socks and a slightly less constricted feel. The good news is that shoes are very well vented and cool. The bad news, at least during the cooler months, is that the shoes are very well vented and my feet are becoming ice blocks. I’m seriously contemplating overshoes to keep my feet dry and warm. The only annoying gripe that I have is that Shimano don’t provide additional cleat screws and plates. I managed to lose one early on and fortunately the the kind chaps at City Cycle Galleria gave me spares. Overall I’m really impressed with quality of the shoes. I bought these pedals on the strength of many outstanding reviews and this one in particular convinced me that this was the right option for the type of riding that I do. So the SPD-SLs….oh man I had no idea how difficult it is to clip into ‘Look’-a-like pedals. My initial ‘strike rate’ was about 25% and I was losing 30 to 45 seconds of time at traffic lights trying to clip in. Also, I had to unlearn the, now unwise, habit I had of resting my not clipped-in, right foot on the pedal. The combination of new slippery carbon fibre shoe sole and beautifully smooth pedal do not allow the rider to put any power into the reverse side of the pedal. After my first couple of rides, I developed a bruise the size of an orange on the back my right calf muscle. I would miss the clip in or attempt to rest my foot on the pedal and have the crank spin round and smack the pedal into the back of my calf….ouch!!! I’ve figured out my own method for clicking in and I’m somewhere near 75% first time contact. Now that I’ve been riding on them about 10 weeks I think I can say they were worth buying, although I haven’t necessary achieved the increase in speed that I was hoping for. I’ve fitted the yellow cleats in a neutral setting and I’m still fiddling my fit on the bike to find the best way of using them. I’ve read that the blue ones might be better and I’ll try these next. 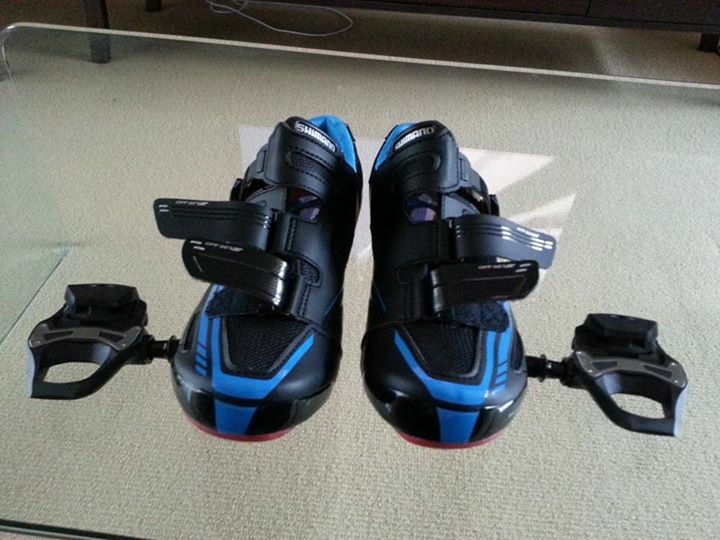 This entry was posted in Product Review and tagged pedals, product review, road shoes, Shimano on July 1, 2015 by Marv.